District managers are the in charge of the multiple stores in a particular region. The post of district manager is very advanced and they are given many complex and important tasks such as monitoring the daily operations, recruiting the new staff, maintaining the stock of the company and a lot more. It is the demand of your professional life that you write an effective resignation letter before you leave. Resignation letter becomes a permanent part of your record in a company. It is important to stay positive and professional at the same time. It should be kept in mind that the resignation letter is not a place for criticizing the job or writing the problems that you had. It is not recommended to include anything negative in the letter such as complaining about the company or co-workers. The message that you want to include in the resignation letter should be taken into consideration. There should not be anything unnecessary in this formal piece of document. You may want to maintain a friendly relationship with your boss appreciating him instead of criticizing is recommended. 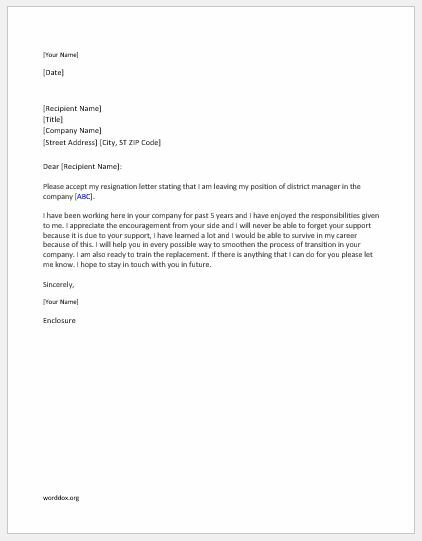 Below is a sample district manager resignation letter. Please accept my resignation letter stating that I am leaving my position of district manager in the company [ABC]. I have been working here in your company for past 5 years and I have enjoyed the responsibilities given to me. I appreciate the encouragement from your side and I will never be able to forget your support because it is due to your support, I have learned a lot and I would be able to survive in my career because of this. I will help you in every possible way to smoothen the process of transition in your company. I am also ready to train the replacement. If there is anything that I can do for you please let me know. I hope to stay in touch with you in future.